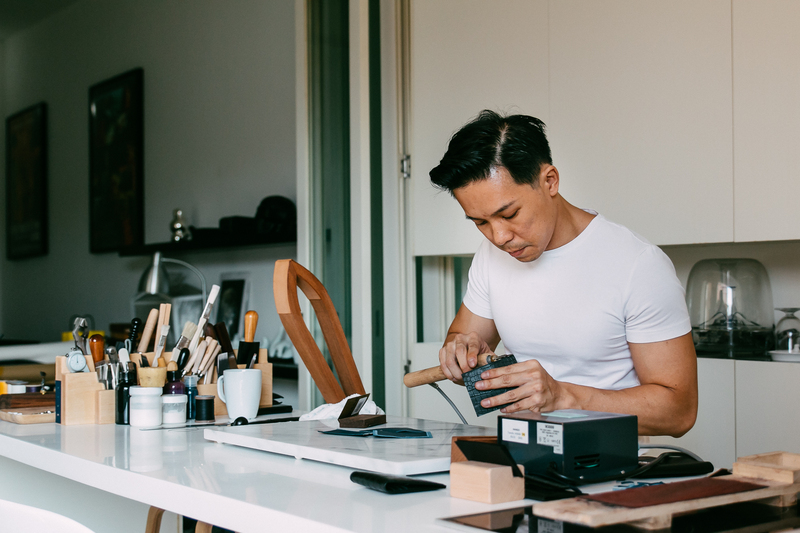 The interiors of leather craftsman Roy Chan’s apartment are thoughtfully decorated with shelves housing neat rows of books, and its white washed walls a clean backdrop for the framed movie posters by Hong Kong filmmaker Wong Kar-wai. A pile of rolled up leather takes its place beside the sofa, while a collection of leather cases occupies the coffee table. ‘Sorry about the mess,’ says Roy as he pours me a cup of water. ‘These leathers are sourced from different countries,’ Roy says in response to my gaze at the leather pile, some rolls spilling out sideways, revealing colours of caramel, dark brown, and pink. 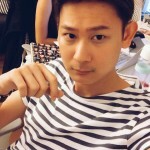 ‘I travel to Hong Kong, Japan, Thailand, Korea and France to do the sourcing for these,’ he continues. The sun breaks through the heavy cloud and light streams through the windows, illuminating the work space. Dressed in a simple white tee shirt and green cargo shorts, Roy eases into a wooden stool and leans on a long table that runs along the windows. He casually picks up a piece of crocodile skin leather. 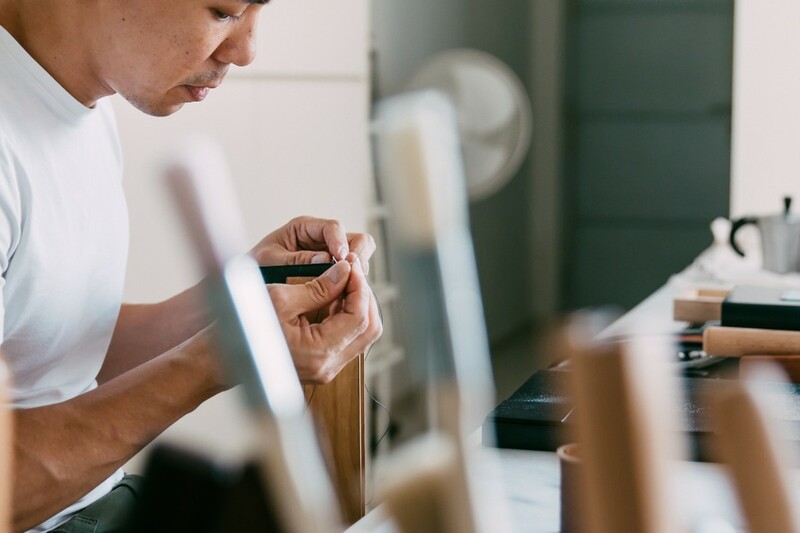 ‘So, what would you like me to make?’ Surprised by the question, I have to think quick – something simple, useful and does not take too long to craft. I suggest a cardholder. ‘And a cardholder it is,’ Roy says agreeably. The natural convivial atmosphere has us talking about everything from art to photography to leather crafting. Roy is a self-taught crafter who specialises in small leather goods. 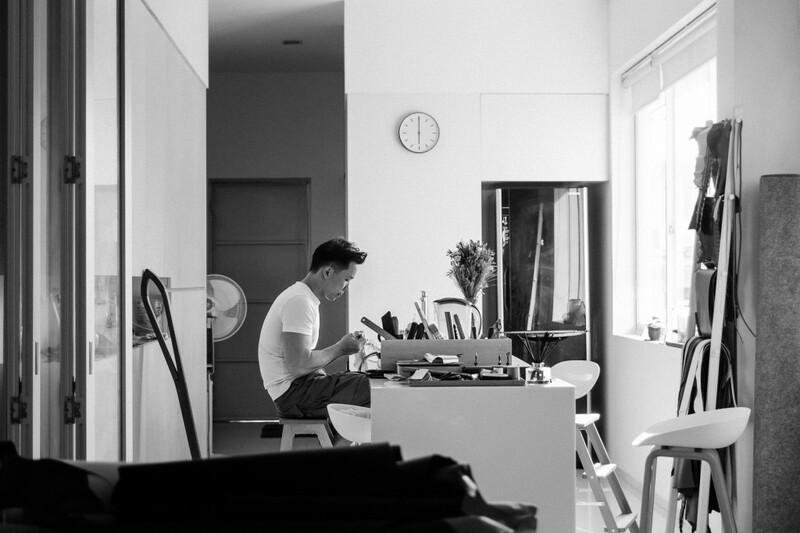 Exposed to leather at a young age, Roy started crafting when he was 15. Reminiscing the past, he tells me, ‘My father got me a bag of leather from a market. 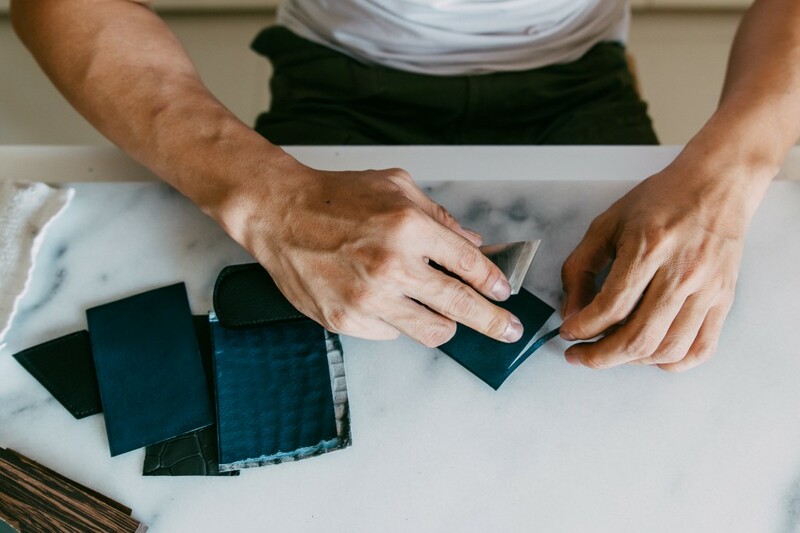 I started to have a feel for the leather and made my first pencil case at 15,’ he reaches out to a collection of small leather pieces, ‘it looked horrible, of course,’ he laughs. 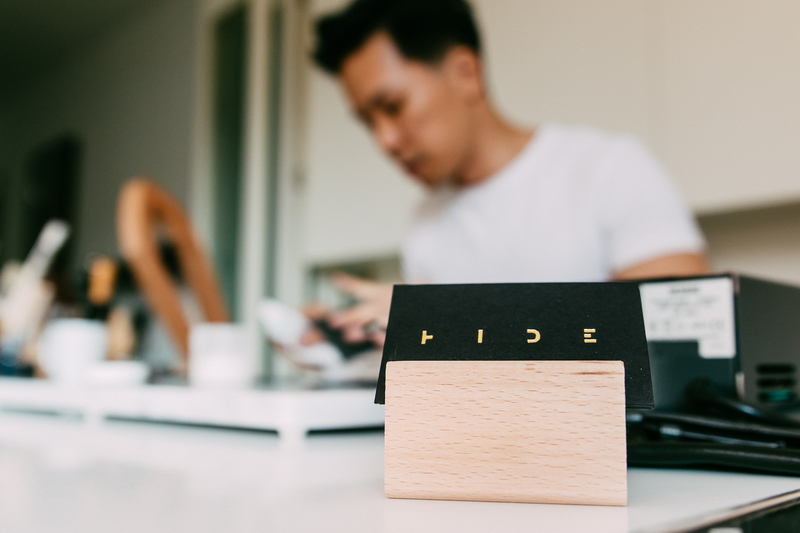 Years later, he started Hide & Craft, a bespoke leather crafting service for customers looking for personalised small leather products. 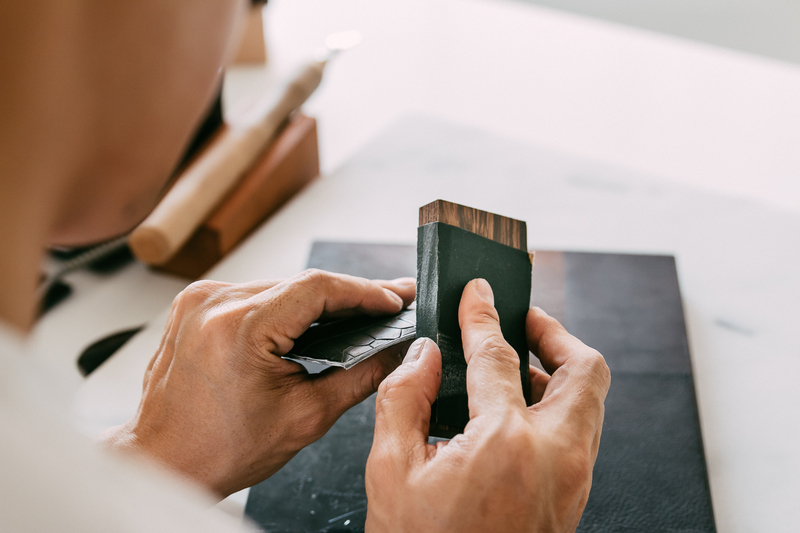 Roy takes out a wooden clamp half his height, and begins to stitch the pieces of leather together with precision. 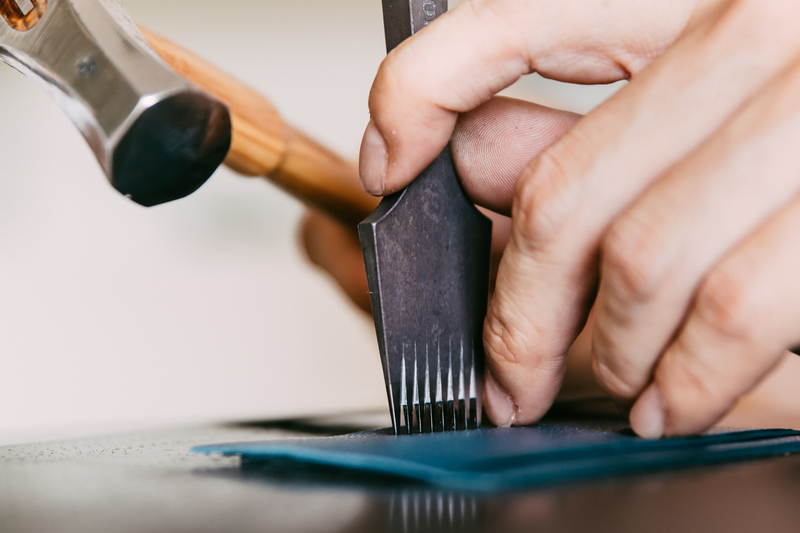 His fingers move intuitively, rigorous but careful, as he performs the art of saddle stitching. ‘Each stitch is created so that if one stitch were to come loose, the rest of the stitches would not be affected,’ he explains. He finishes the stitching and with a hammer, lightly taps the seam. ‘This helps to make the seams less apparent, and after that I’ll shave, sand and wax it,’ he says. ‘How long does it usually take to craft a cardholder,’ I ask Roy. ‘One that I’m happy with? A whole year!’ he laughs. 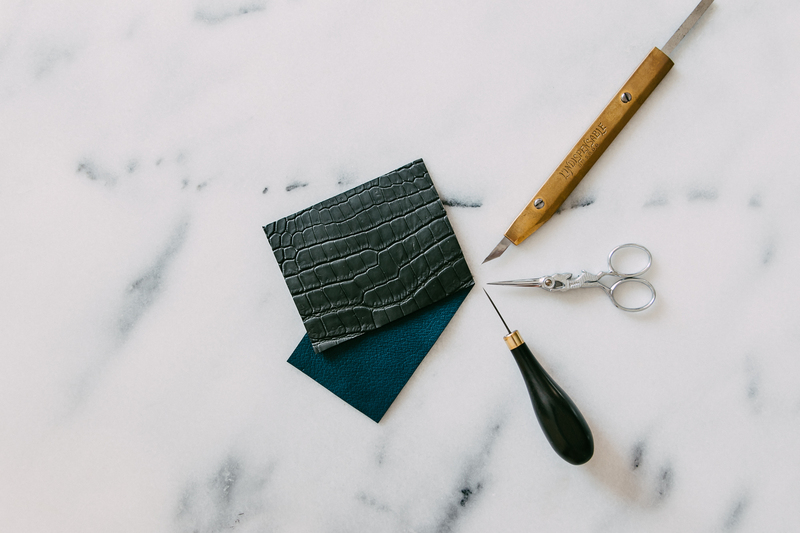 The process takes place from knowing the leather to studying how it stretches, breathes and moves as the craftsman shapes it. ‘For each product you make with a different leather, it is as good as re-designing the entire thing,’ he says. Everyone has their own “handwriting”, and it is this that makes us who we are. Roy holds up the cardholder, the leather gleaming subtly under the late afternoon light. The seams are perfectly aligned, and its purple paint at the edges a beautiful finishing touch. From his first pencil case at 15 (which he still holds dearly) to this, Roy has certainly come a long way. A question I had left unasked from our meeting was how Roy’s customers feel after receiving their handcrafted leather pieces. But I think I already know the answer to that.